Moving onto their next package, you can learn about this free exchange server program and MCSE 2016 cloud computing program as well as computer infrastructure program. Their next of the package comes the course of learning about free web designing courses and these courses comes along with the learning of SMO/ SEO as well. You can avail their last one package and it is about the learning of Hyper-V program along with VMware. For the information these Corvit systems are located in Lahore. They offer and provide different set of computer and information technology related programs. 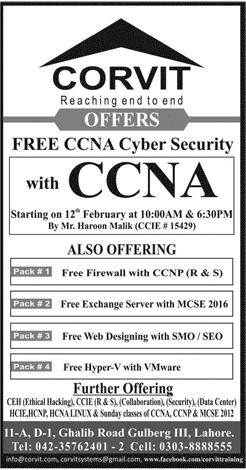 You can learn about the different set and bunch of IT courses from Corvit Lahore. Their other packages and programs are linked with programming and networking. Since the time of 2000, this Corvit Lahore systems are working in Pakistan. Thy act and work in the form of trading human resource. Large number of students get their training from here. Theur facilitate theirselves and know the proper and correct usage of networking products. They act as advisors and come up with effective business technological solutions. This firm plays an important role in the world of information and communication technology. They have now become the pioneer right in this world of networking. In the entire region of Asia and Middle East, USA, this firm has their own personal offices. This Corvit Lahore carry out and process large number of mega-projects. It has received more than and about 5 years of ISO 9001:2000 accreditations and certifications. Many of the international clients have received 100% satisfaction from this firm. You can visit their Lahore office, its address is 14-D-1, Ghalib Road, Gulberg III and have more details about their on-going programs. They offer and deliver professional and high standard and level of technical education.